There were two 45 release under the name Earl Jenkins - both from Louisiana. The first is a good, strong version of William Bell's evergreen You Don't Miss Your Water for Lloyd W Reynaud's eponymous label. Jenkins is a really emotional voclaist with a marked "crying" tone and wavering vibrato - both stylistic traits more obvious on the uptempo flip (which has nothing to do with Brother James' later dance). Great horns too - check out the great baritone sax. Oh Boy is a really excellent deep ballad in the grand manner. The mysterious Mr Jenkins gets really involved in the song especially in the middle rap where he is accompanied by a very busy lead guitarist. The falsetto burst just after this is magic - and don't you just love those "ha ha" interjections. The subdued horns really finish the whole track beautifully well. Again Earl's special vocal traits are more readily noticeable on the uptempo side. 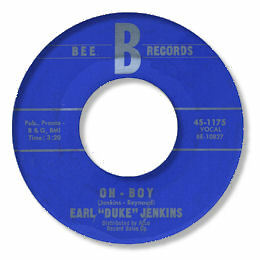 The writers of both tracks are given as "Jenkins - Reynaud" so Lloyd Reynaud may have had something to do with the Bee label. My friend Naoya Yamauchi has noticed the strong resemblance of Mr Jenkins vocal style to that of the great Bobby Angelle. Now Angelle started his career in rural Louisiana recording as Roland Dice. Could Earl Jenkins be another of his recording aliases? Well there is strong circumstantial evidence in addition to aural similarities. 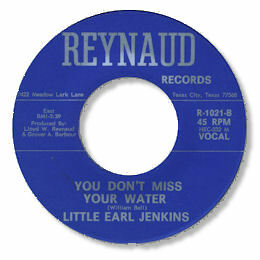 Lloyd Reynaud started running his Reynaud label from Opelousas, LA maybe using recording studios in East Texas or in deep Louisiana, possibly Lake Charles. The gap between the Jenkins releases allow for the two Dice 45s and the Bee 45 may have been cut a little earlier than 1966 when Angelle had already decamped to the West Coast. The thought that this guy might be Angelle is a fascinating idea - can anybody help with this puzzle? Special thanks to Naoya Yamauchi for his good ears and detective work. And to Martin Scraggs for info on the date of the Reynaud 45.